The Hydrophilic Personal Catheter is packaged with its own sterile water packet. The Hydrophillic Catheter is an intermittent catheter that's easy to use wherever you go. Everything you need is in the package, so you're free from worries about catheter preparation. It's easy on delicate urethral tissues. The gentle, silicone design and hydrophilic coating provide nearly friction-free movement, without lubricating gel. It's easy to maintain sterility. You simply wet the catheter with its own sterile water, avoiding contamination from tap water. 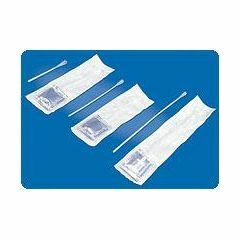 The sterile water packet included in the Hydrophilic Personal Catheter eliminates worries about clean water sources, discrete catheter preparation, or messy transfers from a sink. It's easy to maintain sterility since the sterile water packet eliminates contamination from tap water. The Hydrophilic Personal Catheter sets a new standard for ease-of-use. Its proprietary design and coating make it easy on delicate urethral tissues, while its patent-pending packaging makes it easy to prep and maintain sterility in any setting. Hydrophilic Personal Catheter is as easy as 1-2-3. The Hydrophilic Personal Catheter is an easy to use alternative to latex or PVC catheters. Its all-silicone construction is free from the allergen, toxin or disposal concerns associated with other catheter materials. My husband uses these at work so he can catheterize quickly and then throw away. No washing catheters in public bathrooms. I started using this product as a convenient travel item. I also kept them at work for use during the day. After a while, I decided that this product was so much more flexible and easier to use than the catheter the doctor had given me to use. I now use this exclusively. Safe. Lightweight. Easy Storage. Convenient. The best catheter I have found to discreetly carry and use. Folds/rolls up to carry in your pocket, easy to use in a bathroom stall, put used catheter back in package and dispose of discreetly. It would be the perfect product if the material was about 20% more firm and holes provided great flow for quicker cath. I have also found the saline package sometimes difficult to activate. With the above being said- it&acirc;&#128;&#153;s the best for an active individual who wants to be discreet. The best hydrophilic catheter ever used. The self contained water container eliminates the need to carry your own lubricant with you. I found this to be extremely helpful. Easy Storage. Convenient. Safe. Lightweight. Due to my enlarged prostate and prostate cancer I am totally dependent on catheters for all my urination needs. I have tried several other manufactures products - yours is the best. I just wish it were a little more affordable. How do you know what size to order? I don't know about the specific product you asked about but I got samples from Coloplast by responding to an internet ad. I used latex catheters and K-Lube and had problems inserting them all the time. Changed to Hydrophilic catheters with the self lubricating packs about a year ago and have never had a problem inserting them since. They are more slippery then any lubricants I have ever used. After the water is added they are supposed to be like having lube added from one end to the other. After trying hydrophylic catheters I've gone back to regular catheters. I've been using catheters about 6 months and have tried most types of self catheters. Hydrophilic catheters provide lubrication over the entire length without needing to lube it before insertion. They are very handy, very slippery, and very easy to use. I won't use anything else. Can they be used straight to toilet ? Asked on Aug 6, 2012 3:56:36 PM by Dave from Ga. I agree, they can go stright to the toilet. I believe this is a feature of the intermittent catheter. I want to applaud Jennifer from Arizona on her excellent customer service! I messed up an online order, and she called and had the order straightened out within hours of my placing it. Kudos to Allegro for having such a great employee! Thank you! I am so glad I found your website. My first order was delivered the next day. I was really surprised. The supplies I ordered are excellent. I have no complaints, only praise. I will be back for more. I will spread the news. Again, thank you so much.